More tools on the Tools - Restoration and Rebuilding page. Maintaining the livability of your home is a constant challenge in prosperous times as well as periods of recession or worse. Roofs leak, siding falls apart, porch studs, beams, and pillars may rot from the bottom, causing a dangerous condition. In hard times, hiring a repairman (if even available!) at $40.00 per hour for simple home repairs may be impossible. With a few basic tools and a beginning carpentry book on home repairs as a guide, most anything can be repaired by a determined person with the will to keep his house in order. Rodale Press (Emmaus, PA 10849) markets a book called "Build It Better Yourself" which has plans for almost everything. From gardening, cold frames, food dryers, etc, to construction and home repair projects, it is all there. You will need my "Booklets by Miles" for ultimate survival, as the unique information in these packed guide books is not easily found elsewhere, if at all. Still useable carpentry tools are often to be found at flea markets, complete with a carpenter s carrying tool box to keep them together and organized. If you have to assemble all of the tools yourself, it gets more expensive and time consuming. Common carpentry tools include 12 and 16 ounce claw hammers, nail pullers, a rip saw, cross cut saw, carpenter s square, hack saw, staple gun, 8" and 12" levels, miter box and saw, counter sink, hand drill and bit selection, screwdriver set, wood rasps, etc. A word to the wise: Buy a good assortment of nails, screws and bolts and nuts. Build your own water level. You will need these to rebuild everything, and they might be impossible to find in a crisis situation. In the event of a disaster, or an evacuation to the deep woods, the tools listed above (and the tools listed in woodcutting) are all you need to build a livable log cabin or other shelter where you can be warm, safe and protected from the elements - an absolute necessity for long-term survival. It normally takes two strong men to build a log cabin, but with levers and pulleys, the job can be done by one person. Look at the photo below. That log cabin, faced with 1 x 12's on the upper floor to cut the draft, was built by my father and grandfather - I was born there! 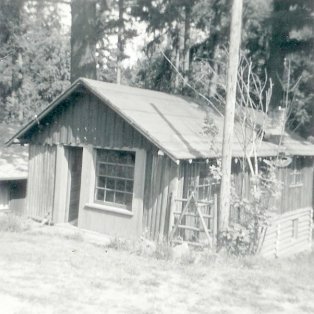 The photo was taken 45 years after the log cabin was built, so ignore the telephone/electric pole - the cabin was built without electric tools, just the hand tools listed above. One point that is not readily apparent to novice builders should be mentioned. Nails are not mandatory! Everything does not need to be joined through the use of heavy hammers and huge nails. Take a look at #14, Gardening, and see the greenhouses and patio I built. Check out #3 Water and see the shed building I constructed to cover my water storage tank. That construction was entirely done using plated decking screws. Screws cost more than nails, and the holes should be predrilled, so it takes more time as well. But, the screws can be removed! This is a huge advantage. If damage should occur, a single stud or beam can be removed and replaced. This renders the repair job much easier. And if the water tank develops a leak (God forbid! ), the entire building can be easily disassembled, the tank repaired, then the shed rebuilt piece by piece. If the water tank shed was built using nails, I would be hard pressed to salvage any useable lumber at all. In most situations, only one side of the shed would be dismantled to repair the water tank leak, and that is only possible if screws instead of nails are used in construction. And in a survival mode, wooden pegs in holes made with an augur will secure wooden construction quite securely.